Time travel is possible and I have experienced it. Last Thursday. At The Fifth. That famously slow freight elevator carried me back 15 years as it rose to the fifth floor. And when the heavy wooden doors slid apart, everything was as I remembered it. A log fire blazed in the hearth. Candles twinkled on linen-covered tables and gleamed off the old wooden posts and beams of that timelessly elegant space. And there in the tiny kitchen was chef Didier Leroy, tousled black hair and all, hard at work grating black Perigord truffle into oeufs en cocotte, looking exactly the same as he did in the year 2000 when I named his work at The Fifth the best food in Toronto. Bringing Didier back for a guest appearance was just the latest brilliant idea from owner Libell Geddes (though there are two even more recent brainwaves to be found at the bottom of this post). The Fifth Grill’s resident Executive Chef, Brad Livergant (one of Brad Long’s talented protégés) was delighted to share his stoves for the evening. I was delighted to taste Didier’s impeccably disciplined, refined cooking once again in such a beautiful setting. He began by sending out a disarmingly simple amuse – a toonie-sized disc of perfect pastry spread with a teaspoonful of finely chopped ratatouille, sprinkled with a suggestion of parmesan cheese. I couldn’t resist ordering the oeuf en cocotte Perigourdine. There were two of them, identical in their ramekins, each one a dark and blissful well of flavour. The egg’s yolk was still runny, thick shavings of truffle and cubes of foie gras nestled over and beside it, then the whole treasure trove was drowned in a dark, heavy Madeira reduction. It was spectacularly rich, the silken textures cut by the accompanying wine, Norman Hardie’s razor-sharp, minerally 2012 Riesling. My date, Libell Geddes, chose Didier’s alternative appetizer, a subtle, delicately flavoured tartare of loup de mer, the fish’s natural sweetness enhanced by a generous amount of chopped fresh herbs – chives, parsley and capers amongst them. Again, the wine match was spot on – Château Tour de Mirambeau 2012 Sauvignon Reserve – all elements lifting the sea bass into the light. Chef proposed two main courses, one of them a salmon fillet Dieppoise, the juicy fish smothered in shrimp, mussels, mushrooms and a white wine sauce. I had the lamb – a gorgeous rib off a rack that Didier touched with a little goat cheese and tapenade then wrapped in a ball of crisp, glossy puff pastry. It shared the plate with a small square of carrot mousse, almost as ethereal as foam, and a single roasted and peeled cherry tomato. Such a spare presentation! Nothing added but a little reduced lamb jus to serve as a sauce beside the other pristine flavours. Domaine de la Montagnette 2012 Côtes du Rhône Villages came along for the ride. And to finish, a juicy tart tatin with a shot of calvados or a puck of dark chocolate mousse robed in even darker chocolate and topped with a flourish of gold leaf. A shot of Crème Yvette was the charmingly retro accompaniment. It was a beautiful meal, a reminder of how seductive classical French cooking can be. Since his own restaurant closed, Didier Leroy has been consulting with Charles Khabouth, who is opening a twin of Bloor Street’s Bistro La Societé in Montreal. I hope he comes back to do another evening at The Fifth, though, truth be told, I would follow him anywhere. Now, as promised, two more fabulous ideas for this weekend at The Fifth. 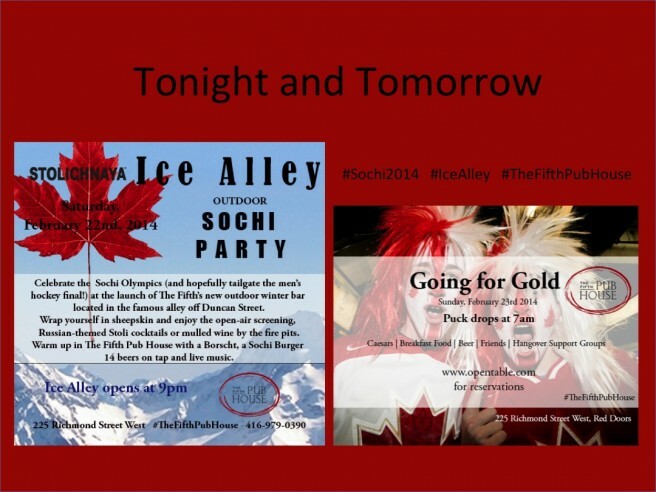 Tonight sees the opening of its Ice Alley bar, an outdoor ice bar in the famous alley off Duncan Street. “You see this throughout the winter in Switzerland,” says Libell Geddes, “so we thought we’d try it here.” From 9 p.m. onwards there will be fire pits, Russian-themed Stoli’ cocktails and mulled wine and a giant outdoor screen for watching the Olympics. Direct access to The Fifth Pub House lets you pop in to warm up and get something delicious to eat. Tomorrow morning, The Fifth Pub House is opening before dawn (6:30 a.m.) for the gold-medal hockey game. Promised are “Caesars, Breakfast Food, Beer, Friends, Hangover Support Groups.” What a great place to see our warriors do what they do best! The Fifth Pub House can be found at 225 Richmond Street West (the red doors). 416-979-0390.